You like to eat. You want a healthy snack. You’re hungry… all the time. It’s the same for all of us. We’re all hungry all the time. My kids are always asking for food… always on the prowl for the next snack, and if I honestly listen to my own belly… it’s saying the same thing. As adults, we’re the same as the kids. We simply practice a little more restraint… unless we don’t. When was the last time you ate something? How long ago was it? What did you eat? How long will it be until you reach for the next nibble, or full on plate? I’m not trying to make you feel guilty about eating. We all need to eat. It’s one of the joys of life. It’s not eating that is the issue. The problem is what we eat. Most of our so called food, and go to snack foods, are just a bunch of junk. They’re empty calories stuffed full of refined sugars, harmful additives, and ingredients you can’t even pronounce. When we’re hungry, and give in to temptations, we reach for snacks that aren’t healthy. Snacks which rob our bodies of nutrition. Snacks full of sugar and devoid of nutrients. We end up eating food that does nothing for our health and well-being… for our life’s vitality. However, it doesn’t have to be that way, right? Of course, healthy snacks do exist, however, they can be time consuming to prepare and expensive to buy. The convenience of processed and packaged snack foods seduce us. They’re cheap and convenient. You don’t have to do anything… just open and stuff. Even so called “healthy snack foods,” ones sold in a bag or a box, should be looked at with a skeptical eye. Just because you bought it at the health food store, and it says all types of fancy health toting slogans on the package, be wary. Look at the ingredients. What are the additives? How much sugar does it contain per serving? How big is a serving… and more important, how many servings are you likely to eat in one sitting. All you have to do is grab that sucker up out of the ground, knock off the dirt… or if you have them in your root cellar, or your refrigerator, just reach in, grab one and munch away. 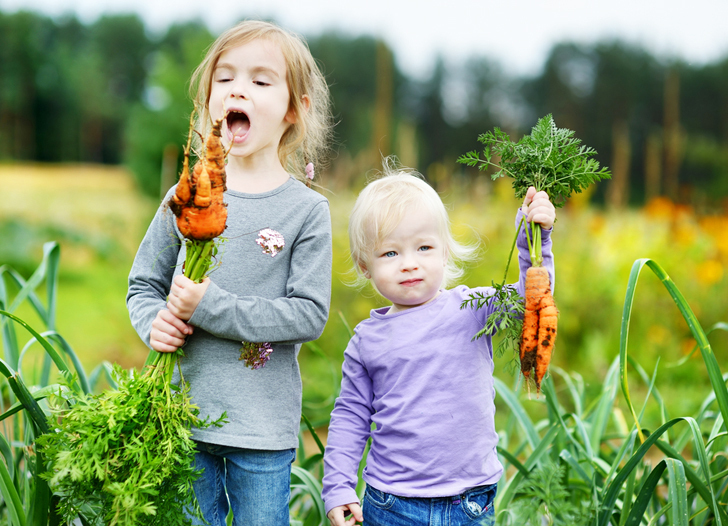 The great thing about carrots is that they are easy, they taste good… and even the kids like them. They’re crunchy. They’re sweet. And they’re good for you. We all know carrots are good for us. They’re full of Beta-Carotene… Lutein… Fiber… Vitamins… all kinds of goodies. Carrots are a quick and easy healthy snack. My grandmother, she used to take carrots, peel them, cut them into long thin slices, and put them in a glass of water. She’d have them on the kitchen table ready for us when we got home from school. It was a quick snack to keep us out of her hair while she finished cooking dinner. I’m not as good as my grandmother. I don’t have her touch. You won’t find me cutting carrots into skinny long sticks and artistically arranging them in a glass of water. I simply have my kids run and grab a carrot,,, and eat it. They love it. The other day we were visiting one of our favorite hotspots for family getaways. There is a place where natural hot spring water flows from a pipe in the ground and collects into a series of beautiful pools. It sits directly next to one of the most pristine mountain rivers I have ever drunk from. 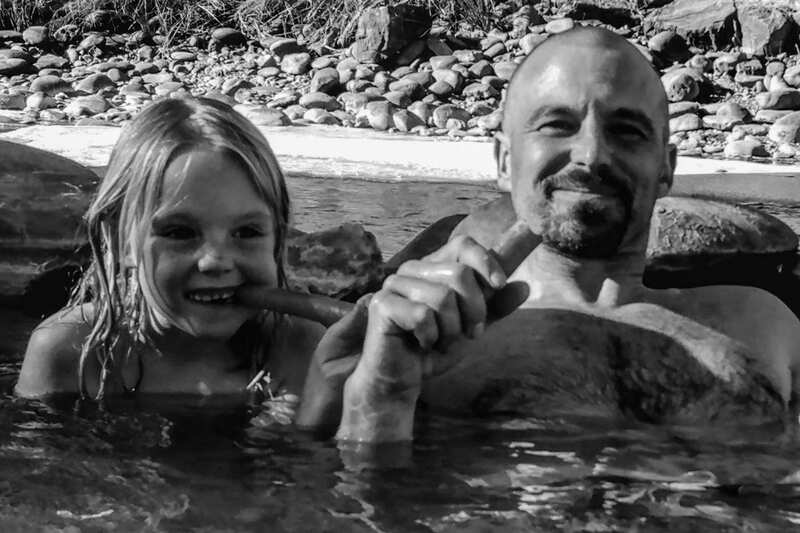 There’s a natural hot springs in our town… and it’s free. My family and I frequent this as our natural playground, picnic area, and one of our favorite weekend hangouts. When we made it to the “Hippy Dip” (the free hot springs is dubbed the Hippy Dip by locals) there was a couple already soaking. They were enjoying a relaxed atmosphere, alone in the pools. If I’m not mistaken, they were also enjoying a mid-day snort on the bottle. However, they were discreet. They were kind and courteous. The man was generally gregarious, and the lady gentle and observant. We interrupted their romantic privacy with my rambunctious kids splashing, squirting, and flinging handfuls of mud… full throttle tomfoolery. All was well, living the life. …make sure you pack a snack wherever you go. Our snack bag contained my son’s favorite snack. Carrots. 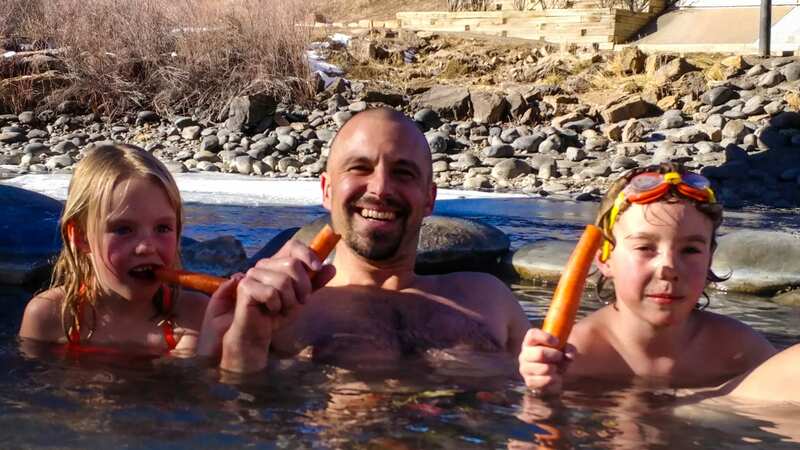 He thought nothing of it when he climbed out of the hot water, wandered over, and gathered two handfuls of carrots. The tops were still attached and he handed them out to all of us. His smile was as wide as if he were peddling cotton candy. He was laughing, half serious, and I think half smitten. Great big carrots. Bigger than their heads, just chomping away. Photo courtesy Amber Kelch. This became the running joke for the rest of the day as we sat munching our orange roots. When you prop a bright orange carrot up against the clear blue winter sky, the contrast is astonishing. The color of bursting carotene screams vibrant goodness. I had a secret plan to bring my camera and take that picture… the bright orange carrot and the brilliant blue sky… but I forgot my camera. She sent more than one, and aside from my bald head, I think they came out pretty darn good. When Did Eating A Healthy Snack Become So Odd? Why is snacking on whole food an oddity? When did it become strange to eat a whole carrot as a snack. You don’t see it often. I would agree. We probably are weird. We sport our uniqueness with pride, or shyness, depending on the day. However, it is entertaining that he thought we were weird… because we were eating carrots. 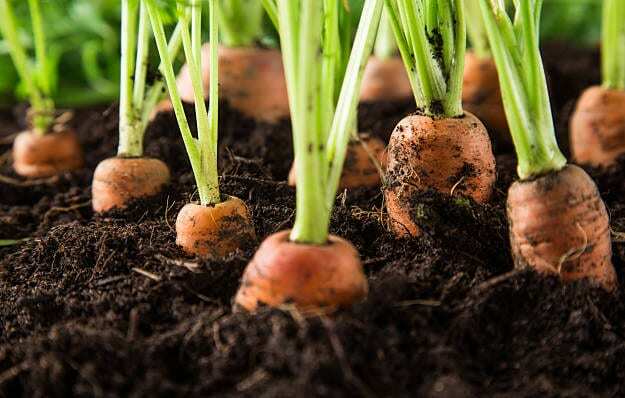 How strange of us, sitting there eating carrots unprocessed, raw, and whole. There is a down to earth nourishing feeling that comes with eating unrefined, unprocessed foods. There’s even a difference between eating those fancy little carrots sticks my grandmother would make, and just having the whole root right there in your hand. There’s nothing wrong with preparation and presentation… and nothing against my grandma. I love her dearly and appreciate her caring efforts, but there is something to be said for grabbing the whole food. When you pull a carrot up out of the garden and shake it off, and there’s left over bits of soil clinging to the sides… there’s something about the experience that is nourishing. Maybe it’s just psychological and all in the head. But there might be something to it. So, that’s my story about eating carrots. 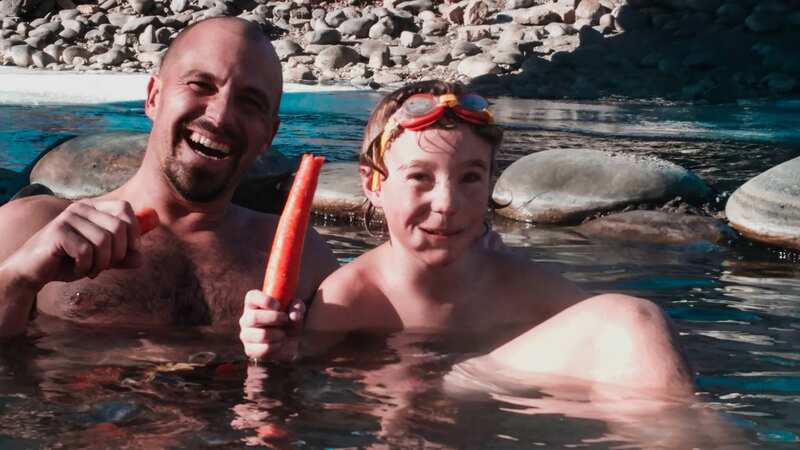 My kids love carrots. I love carrots. They’re a surefire winner when you want a healthy snack. It’s quick and easy. They’re crunchy. They’re sweet… don’t take much preparation… and by golly, they’re good for you. When you want something to hold you over… take the advice of my grandma. Have that little cup of carrots waiting on the table. Or better yet, be lazy like me and just munch the whole dang root. Nourish yourself and your family. Even if they call you weird. Download this ebook to learn how the Growing Dome® can help you grow food all year round. Discover the magic of walking into your back yard and having your own protected garden sanctuary. The Growing Dome® is a self-contained protected ecosystem where you can pull a carrot up out of the bed… shake off the loose soil… and have a wonderful nourishing snack. Ha! I know EXACTLY where the Hippie Dippie pool is, in that cute little town! My very favorite town besides my home town! I go the second week in Sept when I get to make it there.